AUTOMOTIVE SHAMMY WASH CLOTH - "THE SUPERMAX"
Many automotive shops use recycled T-SHIRT RAGS for cleanups. But, there are simply times that you need automotive wipes that are more absorbent. Something big, that can stop a spill from spreading. Mechanics often face oil spills or antifreeze leaks, and the little red rag is about as useful as a band-aid on a broken leg. That’s when you need the SuperMAX automotive wipe. This incredibly absorbent automotive towel will catch spills and leaks, containing them so that the entire work area is not contaminated. The last thing you need is for a mechanic to track oil onto the floorboard of a car or airplane, or to track antifreeze all across the shop floor. The SuperMAX absorbs as much as 8 times its own weight in fluids! So, that oil leak that just dripped its way into the mechanic’s bay? Rather than spreading it around with a rag, lay a SuperMAX on the spots and they will soak into the wipe. 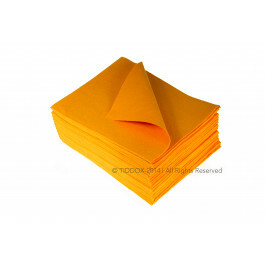 These are thick, large automotive and aircraft towels that are one of the most absorbent floor cloths you can find. You can even cut them into smaller wipes for the mechanics to keep in their pockets. Alternatively, try out the TIDDOX AUTOMOTIVE MAXI WIPES , smaller sized versions of the SuperMAX, that come in portable packs of 10 wipes. They can use them to polish off fingerprints once the job is finished. And, the SuperMAX is affordable enough that you can toss it out, if you don’t want to launder it. It will squeeze out like a sponge, and can be reused indefinitely. To protect finishes and prevent spills from spreading, try the SuperMAX automotive wipe. Other related products from TIDDOX's automotive range of cleaning cloths are the MAXI WIPES, the COLOURED T-SHIRT RAGS, and the OIL DROP SHEETS.